November 14, 1985 Philadelphia Flyers vs Edmonton Oilers. 5-3 win. November 16, 1985 Philadelphia Flyers vs Hartford Whalers. 5-2 win. November 17, 1985 Philadelphia Flyers vs New York Islanders. 5-4 win. Mike Bloski spent 3 seasons in the WHL as a junior player. He played with and against a number of future NHLers as a member of the Saskatoon Blades and later the Prince Albert Raiders. Bloski was undrafted but later signed with the Philadelphia Flyers as a free agent. On November 10th, 1985 tragedy struck the Philadelphia Flyers as their Vezina winning goaltender, Pelle Lindberg, died in a car crash. 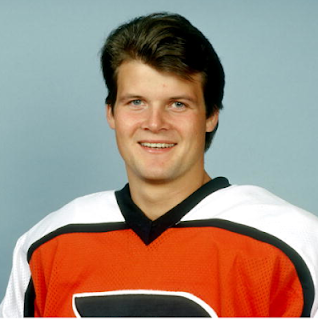 Bob Froese was left the difficult task of replacing him as the Flyers' starting netminder. However, on November 13th Froese injured himself in practise and the duty was passed on to rookie Darren Jensen. With two goalies all of a sudden off their roster the Flyers were forced to look deep into their system and recalled Mike Bloski from the Atlantic Coast Hockey League to serve as Jensen's backup. Bloski served as backup for the 3 games following the loss of Lindberg, including the emotional game on November 14th in which a ceremony was held pre game for the late Flyers star. Mike Bloski played just one more season of pro hockey, retiring in the summer of 1986.